While Orson Allen was brilliant in winning the Shootout – a race billed as the speed championship of Australia – it was the unheralded Barooga Brett who stole the time honours running a blistering 29.078. Despite four of his previous five starts being over the middle distances, Barooga Brett showed extraordinary speed at box rise, passing through the first split in an elite 4.99 seconds. He ran 18.58 to the back mark and powered to the line to slash five lengths of his previous best winning time and record the fastest time seen at the track in almost 12 months, the equal 13th fastest time ever. 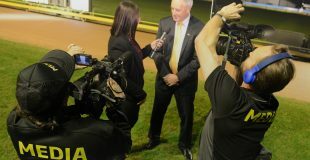 That the $2.60 favourite winning came as no surprise, the time he recorded certainly did, even to owner/trainer Brooke Ennis. “I was quite surprised actually with the 4.99, he can be quite unreliable at the start. Then 18.58 (to the back) and I thought he’s going to run a nice 29.20, but I think the 600m runs has really helped him,” she said. Ennis said they hadn’t done anything specifically to help him at box rise, rather his improved box manners was a sign of confidence and maturity. Barooga Brett – along with all TAB Melbourne Cup Prelude winners – has earned an automatic exemption into the TAB Melbourne Cup heats on Friday 16 November. So impressed with the run, tab.com.au added Barooga Brett to the TAB Melbourne Cup All In market market at $12 – an equal third favourite behind Topgun winner Poke The Bear and the undefeated Black Opium. New South Wales trainer Peter Lagogiane made a triumphant return to Sandown Park with Million Dollar Chase winner Mystic Riot booking her place in the TAB Melbourne Cup heats. Mystic Riot was his first runner at Sandown Park since winning the $410,000 Launching Pad sweepstakes in March with Beast Unleashed. At the time, the win was the biggest of his training career however that all changed when Mystic Riot claimed the recent Million Dollar Chase. With the world’s richest prize under his belt, he now has his eyes firmly set on the world’s greatest race. “We’ll to try and win that too!” he said with a laugh. Mystic Riot won three of her 10 career starts under the care of Lagogiane’s good mate Anthony Azzopardi, however has gone to another level since moving north, winning six of her next nine starts including the last five in a row. “Maybe the smaller kennel helps her, Maybe the change of weather too – I think she likes the warmer weather! Her TAB Melbourne Cup Prelude run was her first start at Sandown Park and is hopeful she can improve her 29.39 winning time. “Anthony has had her here for a couple of trials before but this was her first look at the track in 8 or 9 months, so to come down here and run those times I’m really happy. Should she go on to win the TAB Melbourne Cup, Mystic Riot career prize money would accelerate to $1,477,534 and easily eclipse Fanta Bale’s world record $1,365,175 in earnings. South Australian chaser Spring Bridge made a winning start to her Victorian campaign, coming from off the pace to win her TAB Melbourne Cup Prelude in 29.45. 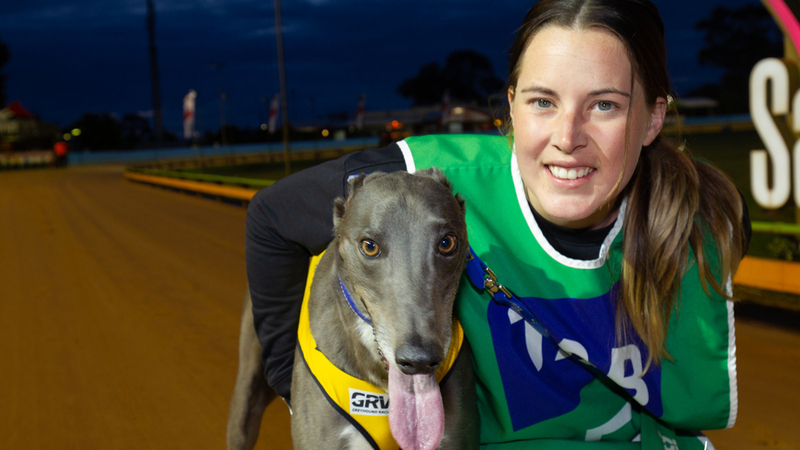 Formerly in the care of Murray Bridge trainer and owner of the greyhound Greg Board, Spring Bridge has been transferred to the powerful Seona Thompson kennel for a tilt at the world’s greatest greyhound race. Had the Thompsons got their way early in his career, the move to Awesome Lodge would have happened much earlier. “We actually tried to buy this dog when he first started racing,” said Thompson. Spring Bridge arrived in Victoria late last month and had managed to trial before making his Sandown Park debut. While he is still settling into his new surroundings, Thompson was very impressed with his debut for the kennel. “I thought he was superb. He actually made a pretty good run for himself – there was a bit of trouble through the first turn, then he got trapped out wide and was three wide the whole way. Later in the night, Thompson’s boom sprinter Black Opium continued to firm in TAB Melbourne Cup markets after making it six wins from as many career starts. It was the biggest test to date for the 20 month old who will be the youngest and least experienced runner in next Friday night’s TAB Melbourne Cup heats, and if she can win the TAB Melbourne Cup, will be come the youngest and least experienced greyhound to do so. Her third victory at Sandown Park was her most impressive for a number reasons. To make the steep step up from restricted win class to open class and set her fastest time was impressive enough, but it to do it such a late race speaks volumes for her growing maturity and potential for further improvement. “Race 11 means a long time in the kennels for a very young dog, so it’s all experience for her. She just keeps amazing me week in week out – I thought tonight would be a test for her – she’s something pretty special. She has started favourite in all six starts at average price of $1.57, her $2.20 starting price last night being the first time she’s started ‘in the black’. Her average winning margin is just under seven lengths, and her winning margin of three lengths last night was as close as any greyhound has got to her. In fact, from the 3045m she has covered in her six starts to date, she has lead for the last 2800m. Black Opium is currently the $10 second favourite for the TAB Melbourne Cup with tab.com.au. Three days after combining to win the $75,000 first prize in the group 1 Hume Cup with Black Impala, good friend Glenn Dainton and Joe Borg couldn’t believe they drew next to each other in TAB Melbourne Cup Prelude last night with Waleonjon and Myrniong Corner respectfully. Believing neither had a chance of winning the race, they decided to make things more interesting by having a ‘sizeable’ side bet on who would finish in front. Amazingly, both would walk away with their money remaining in their pocket after their chasers dead heated for first. “We had a little bit of bet because we didn’t think we could win from the outside boxes. But I guess we just keep our money now!” said Borg. While neither collected on their side bet, both emerged winners with both of their greyhounds earning an exemption into next Friday night’s TAB Melbourne Cup heats. The dead heat was the second at Sandown Park this year after Elevated and Boomer Blitz couldn’t be separated on 18 March. It was the eighth dead heat at Sandown Park in the last decade. Nominations for the TAB Melbourne Cup heats close at 11am on Tuesday 13 November with fields expected to be released early that afternoon. The heats will be run on Friday 16 November with the winner of each heat progressing to the $630,000 TAB Melbourne Cup final on Friday 23 November.